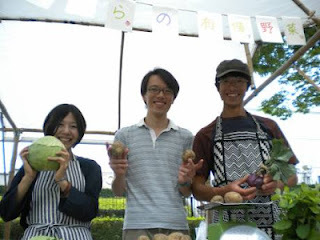 Japan Farmers Markets: Tokyo Farmers Market Outing! A sampling of the farmers you'll meet at the Earth Day Market! It's been a long time coming, but I'm finally planning a little outing to the September 23rd Earth Day Market in Yoyogi Park. September's Earth Day Market promises to be as good as usual with its fantastic selection of organic and fair trade items with the addition of a ceramic art fair. Nothing wrong with a pretty bowl to serve up those fresh, seasonal fruits and vegetables, I always say! Where: Meet on the bridge to Meiji Shrine and Yoyogi Park at 10am. (I'll have something distinct, like a red umbrella, with me so you can find me.) We'll walk over to the market where I'll offer a brief overview of vendors and produce, and then let you loose. I'll be on hand to help answer questions about various items, too. Surely, though, the vendors friendly faces and great products will speak for themselves. Lunch: Plan to buy it there. You'll find some of the best onigiri, breads, curries, and more from vendors and food trucks alike. RSVP : Comment below and leave me your email (I'll keep it top secret, of course.) so I can confirm, let you know about any updates or changes as the date approaches. RSVP Deadline: Saturday, September 22nd. Questions? Don't hesitate to give a shout in the comment section below. I'll get back to you as quick as I can, although I will be away and have limited internet access.